Cartography and Ringmaps | Got GIS? The latest issue of ArcUser magazine (Fall 2013) has a great article and step-by-step instructions on how to create ringmaps (see “Looking at Temporal Changes”) along with a toolbox that can be added in to ArcMap. The article is well written and the toolbox that goes along with it is very clean, simple, and quick. The thing to watch for, especially with these kinds of maps, is the cartography. Making the map is great, but getting the right symbology, legends, etc. on the map is also critical, and ringmaps have some unique features. The first and most obvious are the rings themselves. Identifying what each ring stands for is very helpful. 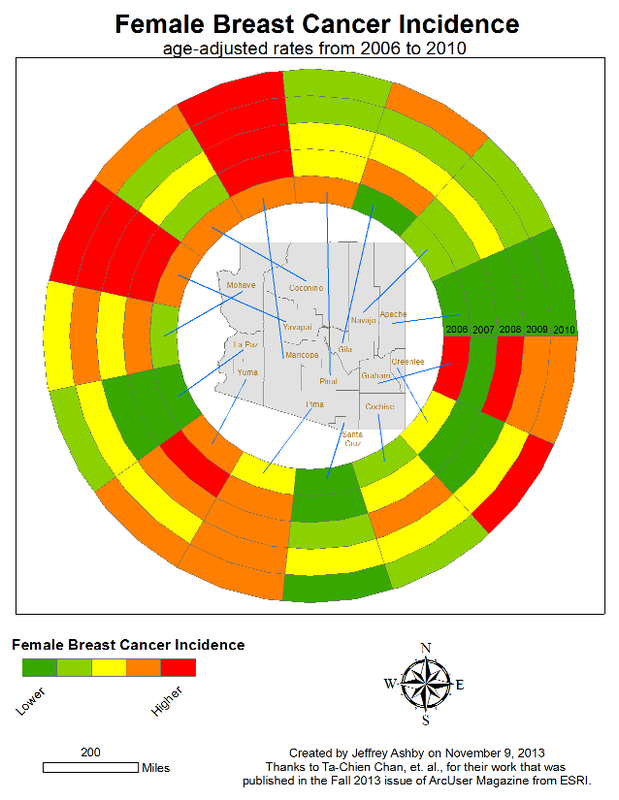 In the example I created based off of the article, the inner ring stands for 2006 data and the outer ring for 2010, but how best to show it? I chose to insert the years into the rightmost rings themselves as text objects. This denotes them without detracting from the map or taking up space with another legend item. Another issue that has to be watched is the polylines that connect the rings to the map. I converted these to graphics and then adjusted them. I also annotated the labels for the counties and adjusted both these and the polylines to be as near the center of the county as practicle, but also watch and make sure that no two polylines crossed near where on ended, making sure it was clear where each line ended. I added the standard north arrow (I went fancy here just for show, the simpler the better with north arrows), the small text and information on where the data came from, and a scale. The scale in this case is not really necessary, but fills in some extra whitespace and helps balance the area. The last item is the legend. Ringmaps are mostly used to show trends, as this one does, so having the actual values in the legend is not as important as identifying the trend. In that case, I went with a low to high method which simplified the legend, helps the reader understand the trend, and makes for a cleaner design. If this was being used in a research paper or report, then I would assume the actual numbers would be found in a table or discussed in the body of the text. Ringmaps are great and I have plans to use them in a upcoming paper I am working on and so this article and toolbox was very helpful and timely. The things I have shown here are not the only or best way, but work well for me. Try it yourself and let me know what results you come up with and where you see I could improve on this one. Autism Spectrum Disorder (ASD) in Indiana Schoolchildren.